I knew this would be a big transition, so this is how we worked toward those two big changes in Eliana's life. Eliana will drink all fluids from a sippy cup when she reaches one year of age. Eliana will be able to manage fluid from an open cup held by an adult at one year of age. We introduced both an open cup (cup without a lid) and a sippy cup when she turned 6 months old. I started offering her small sips of water while in her highchair eating meals. This way she has had 6 months to master how to drink out of a cup and acclimate to it so that she does not become frustrated when it becomes her primary drinking instrument. I started offering formula in a cup after mealtimes and before her bottle around 8 months of age. At 10 months I started giving her opportunities to drink one of her bottle feedings a day from a sippy cup. At a year we were on vacation, so we continued with both sippy cups and bottles. Once we returned home we transitioned to sippy cups only. Eliana's Preferred Sippy Cups: Notice that both have handles! 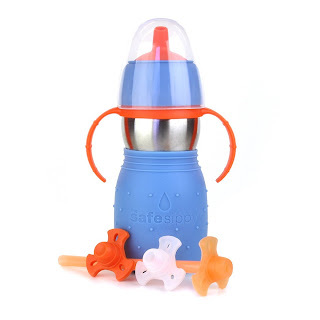 This is a straw cup which is great for children before they can tilt a cup up to drink from on their own. Drinking from a straw is also wonderful for encouraging lip rounding (closing the lips around the straw). 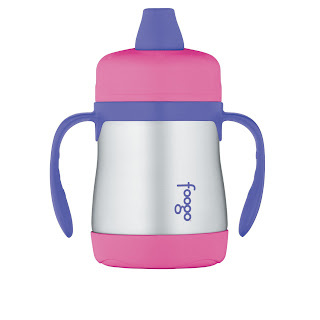 We love this cup because it keeps fluids cold for 8-12 hours! No spoiled milk when out running errands or heading to the beach for the day. I love both cups because they have handles that Eliana can easily hold on her own to self sip. Buying cups with hands is wonderful for when introducing cups because it helps increase the child's independence while drinking. Drinking from a cup is a new skill and being able to steady it easily is important. Eliana will drink only whole milk and will discontinue breast milk/formula at one year of age. This is NOT a practical goal. You aren't supposed to even introduce whole milk until they are one, so don't kill yourself and try to transition them overnight. At a year of age we offered Eliana milk - in a very small amount. We made very happy faces and drank it with her :-) We created a positive association with milk! Well, Eliana ended up transitioning to whole milk at a year and 2 weeks. Our plan went out the window... The first week we were in Florida on vacation and I wasn't going to force something new on her when we weren't in our own element. And then the second week she got sick. Again, I wasn't going to force it on her when she wasn't feeling well. I offered it to her and she drank it, but I had no expectations. Fortunately, she likes whole milk so by the end of the second week after turning one that is all she drank. Eliana drinks about 2-3 6-8 ounce glasses of milk a day. We usually introduce milk during meals. If she finishes the whole sippy cup than I refill it with water. She can have as much as she wants to drink during mealtimes, but only 6 ounces of milk. This way she doesn't fill up on milk and will be hungry for food too. She probably drinks just as much or more water throughout the day as milk. Remember that the doctor may recommend that at a year they transition to a cup and onto whole milk, but that doesn't mean you have to do it overnight! And it definitely doesn't mean that you have to do both at once! If they finish the transition when they are a year and two months or three months than so be it - remember that you know your child best and what will make the transition easiest for them. Don't let yourself or your child lose sleep over the process - that is why it is called a transition - make it a slow and easy one!